Easy to use Outlook vCard converter, vcf converter, vCard Outlook Wizard. SyncWiz add-in is an easy to use Outlook vCard Converter, vcf converter. Use SyncWiz Outlook vCard Converter add-in to convert your Outlook contacts. Microsoft Outlook allows you to convert to vCard Outlook format just one contact at a time. Now however, you can easily convert to one or multiple Outlook vCard files the whole Contacts folder or export only selected Outlook contacts with just one click with SyncWiz vCard converter. In addition, you can import multiple contacts from a single vCard, iCard or vcf file. SyncWiz vcf converter will support standard and custom vCard file specifications. SyncWiz vcf converter add-in for Microsoft Outlook supports all standard and custom vCard file specifications, including versions 2.1 and 3.0. Regardless of vCard file version we guarantee perfectly correct import of all the Microsoft Outlook Contacts properties, including pictures, company logos, live Web links, etc. 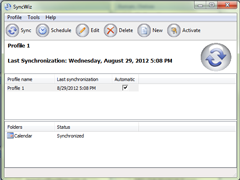 Create vCard converter synchronization profile. Create vCard converter synchronization profile and synchronize your contacts and calendar folders with exported files located on your computer. Select manual or scheduled synchronization mode and set up schedule options. All changes made in Contacts or Calendar folders will be synchronized automatically. vCard Outlook converter will support vCard, iCard, .vcf files in different encodings. vCard Outlook converter supports vCard, iCard and .vcf files created in different languages including Chinese and Japanese and saved in different encodings. Regardless of original encoding, we guarantee perfectly correct export and import of all special symbols used in Microsoft Outlook Contacts properties.